I’ve lived in South Africa for five months now, and think of myself as pretty well settled in. The one thing I won’t ever get used to, however, is the shocking standards of driving on the roads. Especially by people in big, expensive, fast cars who really should know better. 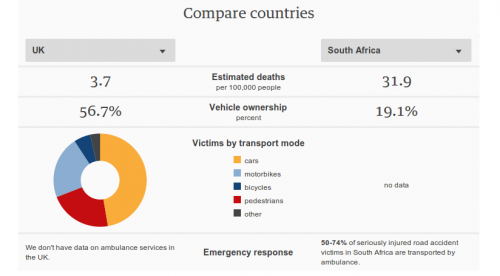 I’ve been researching a story on it and one block I’ve come up against is that there’s been no good, reliable and detailed stats about accidents on South African roads released for two years now. Despite the fact that – by some estimates at least – the road death toll is now higher than the much talked about murder rate (and a more democratic killer of all classes and creeds too). I’m not the only one – there’s gaping holes that should be obvious to fill in the WHO data published on the Guardian today, such as a who’s actually being killed out there on the highways and byways. But the staggering fact remains: fewer people drive here, but the roads are more congested and around ten times more dangerous than in the UK. It really, really doesn’t have to be like that.